Most martial arts schools (mine included) offer a FREE first lesson–but what can you expect at this class? I can’t speak to other instructors, but I can tell you what I offer. First, I forcibly push you into the full splits. Next, I break a board over your head. Finally, I kick you through a plate glass window, to demonstrate the power of taekwondo! Obviously, I’m joking. But, you’d be surprised how many people picture such a bizarre scenario. I’ve had questions ranging from “Do they have to pray to anything?” to “Do I have to get in shape first?” or even “Will my son have to fight anyone?” The answer to all those questions, of course, is no. Taekwondo is about building people up, not tearing them down. Now, don’t get me wrong, there is contact involved (though we endeavor to keep it controlled and most of all safe). But, the first class isn’t more than you can handle. We will start with a warm-up and proceed to basic dynamic movements. Afterward, you’ll practice those techniques, hit some pads, and learn some basic self-defense. Then, you’ll break a board (though not over your head)! I’m NOT kidding about that last part, but don’t be scared. 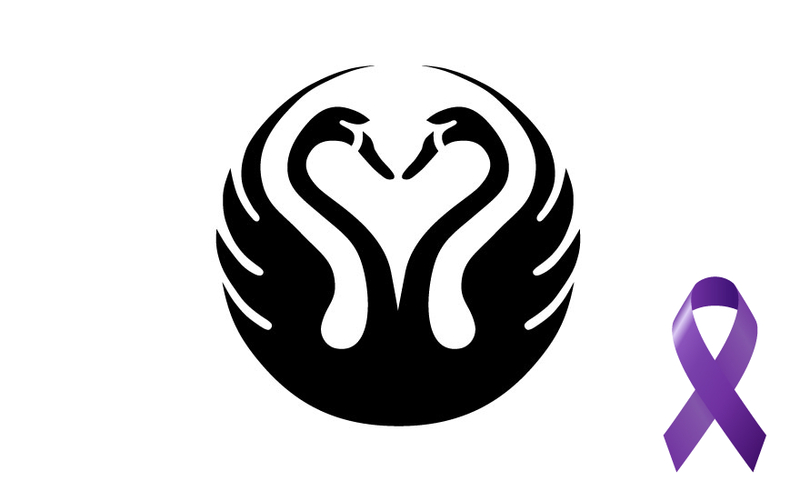 Part of what we do is show you how much power you ALREADY have; we merely show you how to use it. So, the first class will be fun and challenging, not something to fear; though you probably will be sore the next day! Ready to break your board? Click here for your FREE trial. 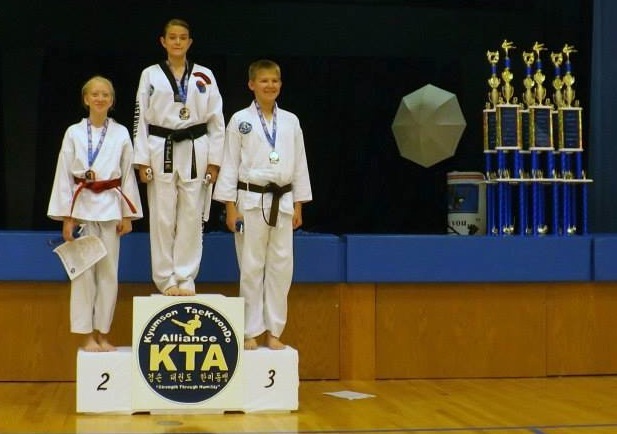 Martial Arts Monday: Why Do Tournaments? In the lead-up to our Olney rank testing, I noticed that a student’s form had vastly improved over last time. I immediately complimented him on how sharp it looked. This incident reinforced to me how the value of tournaments goes far beyond trophies and medals. My instructor, when encouraging students not to stress out over competition, always said that the point of tournaments was to have fun. But, it’s more valuable than just a good time (though having fun is certainly a chief goal). Tournaments stand as a valuable teaching tool. They serve to reinforce everything that goes on in class. Students gain confidence with the first-hand knowledge that what they’ve learned works outside of class, among strangers. In the case of this student, he learned how to make his own form better by observing who beat him. Plus, the tournament stoked the fire in him, making him want to improve. I’ve never been a big fan of competing myself, but it’s hard to argue with these results. Taekwondo isn’t “only” a sport, but the sport part refines and reinvigorates the art itself. Why do tournaments? To get BETTER! Martial Arts Monday: Do I Need to Get in Shape BEFORE Taking Martial Arts? I’m talking to a potential student. We’ve gone through all the standard stuff: class times, cost, how to get started, etc. I’ve answered all their questions and addressed their concerns. Our conversation is coming to a close, and almost as though they’re afraid to ask, they come to one final concern. In over a decade of teaching martial arts, I’ve received that question a lot from adults. The public seems to perceive martial arts as being taught in a sink-or-swim manner, that only the strong survive. The truth? Martial arts is and should be about learning, not about tearing someone down. Every martial arts instructor worth his salt structures classes so that beginners are challenged, but not destroyed. After all, we were all beginners once; many of us were out of shape when we were. If you’re in shape, martial arts is a fun activity that will teach you self-defense while maintaining your fitness. If you’re not, martial arts will help you meet your fitness goals. Ready to get in shape? Click here for your FREE trial! The stereotype of the martial arts school filled with sweaty boys and men doesn’t hold true anymore–now there are plenty of sweaty women and girls joining them! According to New York-based Simmons Market Research, 48% of martial arts participants are female. Martial arts competitions are filled with female champions, like UFC and judo champ Ronda Rousey, shattering stereotypes. Just look at our own Miss Elizabeth Nash, a 3rd degree black belt and trainee instructor with a decade of taekwondo excellence under her black belt, for a local example. Martial arts training provides many benefits to women and girls, most notably by teaching them self-defense. One in five women are sexually assaulted in their lifetimes, and a solid background in martial arts helps women avoid becoming part of that statistic. But that’s not all, martial arts training helps women and girls stay fit, and gives them the confidence to do anything they can dream of. Looking for a fun, safe, rewarding activity for yourself or your daughter? Think taekwondo! 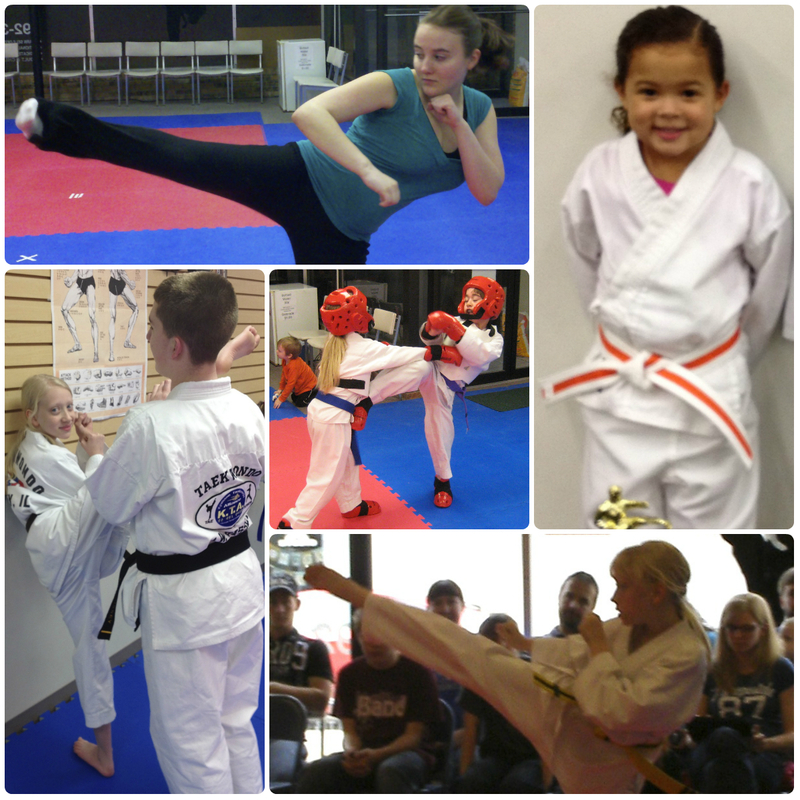 Ready to see what Taekwondo can do for you? Click here for your FREE trial! Taekwondo IS its own martial art now, but it hasn’t always been that way. Taekwondo started as shotokan karate, an Okinawan martial art that had spread to Japan and then on to Korea. However, beginning with its naming in 1955, taekwondo evolved along distinctly Korean lines, with masters and instructors incorporating techniques from native Korean arts like taekkyon and subak. So, what are the differences? 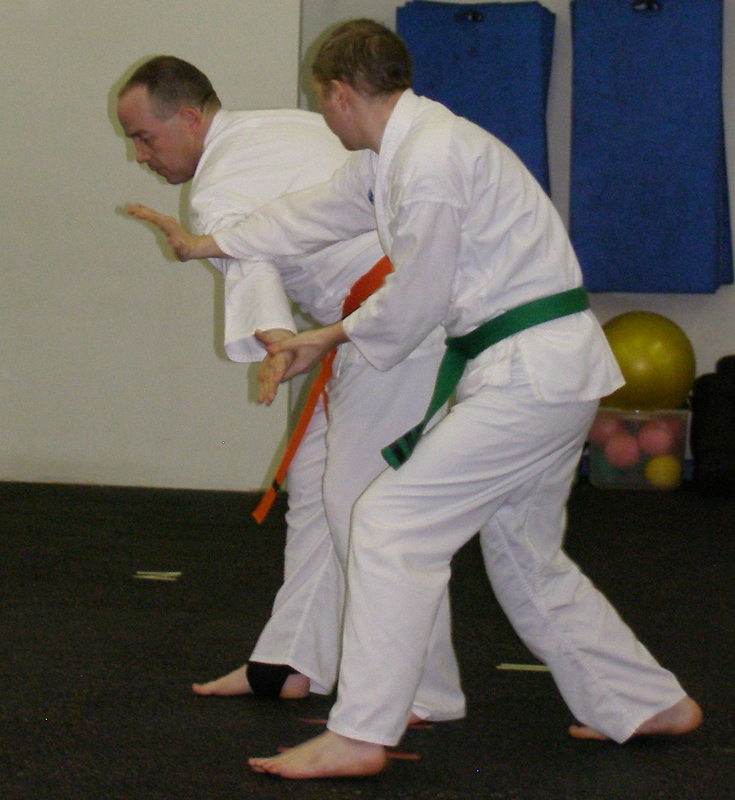 Karate is Okinawan and Japanese, and emphasizes hand techniques. Taekwondo is Korean, and emphasizes kicking. Both are striking arts that emphasize power, mobility, and keeping the fight standing. They are different, but much closer to each other than to grappling arts like judo. Ready to experience Taekwondo? Click here! Plus, don’t miss out on our current special! 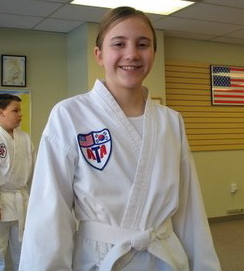 Miss Elizabeth Nash, currently a 3rd Degree Black Belt, as a white belt in 2004. Congratulations on registering for your free trial lesson! What can you expect when you first step on the mat? First, make sure you wear comfortable, work-out clothes (uniforms come later). Shoes don’t matter, because you won’t wear them in class anyway. You’ll start with a simple warm-up and stretching, followed by learning some basic taekwondo techniques. After that, we’ll learn how to use these techniques together, and how they can be applied to self-defense. At the end, you may even break a board! And of course, all along you’ll learn the importance of courtesy and discipline in taekwondo. Don’t worry about falling behind. Your intro class will go at your own pace. You’ll definitely use muscles you’ve never used before, but you’ll still be able to walk out of the school when the lesson’s over. 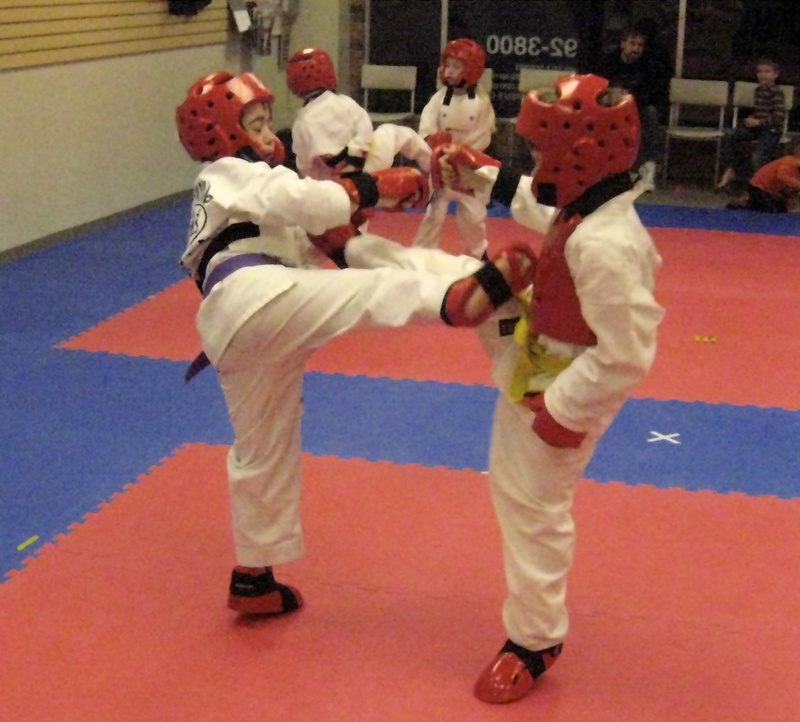 Taekwondo is a safe, fun physical activity for both children and adults. Ready for your FREE lesson? Click here! Plus, don’t miss out on our current special! Taekwondo training builds confidence, emphasizes respect, teaches self-defense, increases fitness, and even improves grades. But how can an individual sport teach teamwork? How does an individual martial art teach teamwork BETTER than team sports? Your child participates in every class 100% of the time. Taekwondo does not merely take attendance or participation. 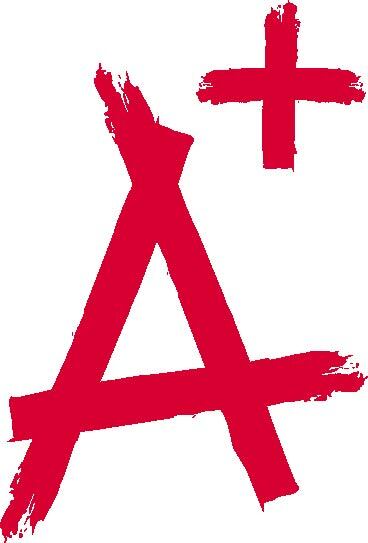 We emphasize group learning, cooperation, and encouraging other students to succeed. There are no penalties for missing practice, and OTC is flexible in allowing a student to learn on his or her own time with private lessons or extra classes. Progress is measured individually for students to earn new belts, but class activities encourage teamwork, courtesy, respect and perseverance. Traditional taekwondo mixes friendly competition with the sense of community and sportsmanship that comes from all students working toward the same goal. These attributes make your child a leader in taekwondo and later in life! Children with martial arts training grow up with an edge in connecting with people and working as part of a team. 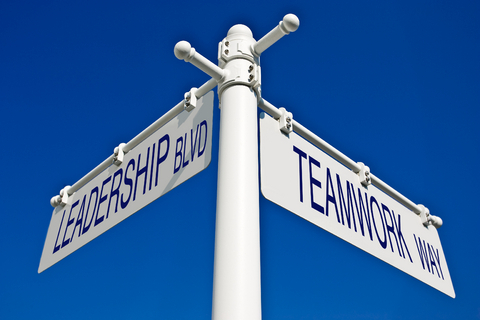 Begin your child’s path to leadership today: call 392-3800 or comment for a FREE 2-week membership! Sure, martial arts training teaches your child respect, discipline, self-control, confidence, and self-defense, but can it help in school? 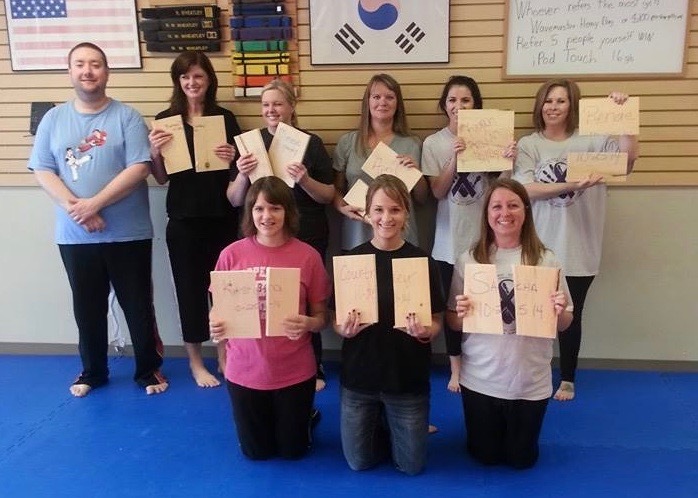 Taekwondo training leads to better grades! Taekwondo training at Olney Taekwondo Center or Princeton Martial Arts sends your child home with the improved confidence and discipline they need to succeed everywhere: school, home, and life. Ready to give your child a leg up? Call 392-3800 (Olney), 385-8400 (Princeton) or comment to get started!